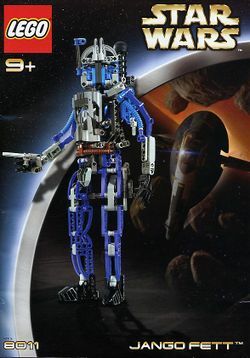 8011 TECHNIC Jango Fett is a TECHNIC set from the Star Wars universe that was released in 2002. It contains a TECHNIC model of Jango Fett. Jango Fett has a backpack consisting of a jetpack and a rocket that can fire, and two pistols and holsters. The mechanism that fires the rocket causes Jango to lean forward at the waist before the rocket is fired. The model is not very posable; the only joints are at the waist, neck, shoulders, wrists and fingers. After being recruited by Count Dooku, Fett became the template from which all of the Clone Troopers were made. One clone was adopted by Jango as his son, named Boba Fett, who was altered from the rest of the clones, having the accelerated growth hormone and the unconditional obedience factor removed. Boba, in his time, would later become the most successful Bounty Hunter in the galaxy, just like his father. At the Battle of Geonosis, Jango died at the hands of Jedi Master Mace Windu, who beheaded him in the Geonosian Arena with his purple bladed lightsaber. Facts about "8011 TECHNIC Jango Fett"
This page was last edited on 17 August 2017, at 02:40.